With the exception of very good TV's (I love my 27" Sony Wega) and pretty good stereo equipment, Sony doesn't seem to do anything very well anymore. MiniDisk - a great format and media but not available on any hardware other than Sony and as a result adoption was limited at best. Clie - A Palm Pilot with a proprietary memory card format and a higher price. Wonder why they didn't do well. BlueRay - or as I like to call it "Betamax: The Sequal"
And now they're killing other companies hardware. 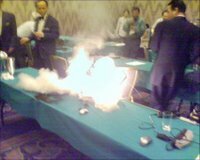 You may have seen or heard the stories of the exploding Dell laptops. Guess who's to blame. Sony seems to be rudderless ship. Can it be long before they completely run aground?